On Valentine’s Day, The Quarter will have three unique presentations viz. tables for two with bubbly and dinner in the lawns, under the open skies, overlooking the majestic Royal Opera House, family tables in our dreamy, fairy lit outdoor restaurant and a fun party for singles in our chic ‘live’ music club. Let’s say ‘I love you’ in many ways to as many people on February 14. It’ll make it all so much better! Dine under the stars in our dreamy, fairly lit outdoor restaurant with your loved ones this Valentine's day. Choose from an array of vegetarian and non vegetarian dishes specially curated for this event. Everyone is welcome! Reserve your tables on Insider or call on +918329110638 or +919326866986. Imagine this - A romantic candle light dinner, exquisite food and cocktails, soothing live music, fairy lights, beautiful weather, in an iconic location under the stars! Sounds right out of a movie? 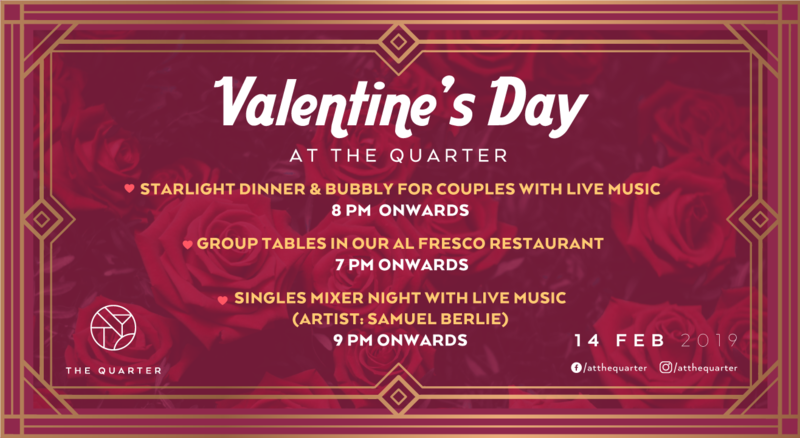 Well we have good news - Your valentine's day can look like this, and more only at The Quarter! Samuel Berlie is a Mumbai-based singer-songwriter and performing artist who has been active on the local and national live music circuit for nearly two decades. His charming vocal styling and endearing stage presence has earned him both a fan following, and a respected reputation as a talented guitarist and singer. Sam has been a regular performer at several live venues, clubs, cafes, and bars across the city for more than 20 years now -- Long & Short, Indigo Deli, Bonobo, Neel, Tote, Amadeus, Out of The Blue, Indigo, The blueFROG, Hard Rock Cafe, Not Just Jazz By the Bay, Canvas, Luna, Nudo and Asilo, just to name a few.